We were super correct… She is the one in the season who has been an on and off friend with almost everybody except Tanisha and Armaan. In fact, she will be the only one as well who have had a fight with everyone as well. Gauahar Khan might have moved out of the house for her love for a day but after she came back, she played the game with conviction and became the winner of 'Bigg Boss 7'. Duh!! Uh!! Well she definitely did succeed… Everyone who has watched even a handful of Bigg Boss episode couldn’t have missed her. Her presence was not shouted through the house because of fights or stuff, but remained a underlined truth because of the way she conducted and managed herself throughout the show. The fact he must have had a word with every Camera of the house…….. helps us prove his self obsession. Most importantly, he knew when to pinch whom to create a whole lot of mist of fights only to wear a mask and enjoy the show. And the winner of Bigg Boss Saath 7 is Gauhar Khan! After much stress amongst the participants, Bigg Boss Saath 7 winner was announced today evening in a glitzy show... and it is none other than the most happening Khansaab - Gauhar Khan! One of the most watched show on Indian Television this year, Bigg Boss Saath 7 came to a grand finale today and Gauhar Khan was announced as the winner. While many were against Gauhar winning, there were many others who thought she was just and fair as a person and participant. Gauhar had the support of her fans and also many industry insiders who are regular viewers of the show who wanted her to win! The show which started couple of months back tested the patience of the contestants who were locked in a house where they had to stay without getting in touch with any body outside the house. There were lots of games which were played inside - some fair and some unfair. We saw some friendships being built while some made enemies too. Love too blossomed and we saw not one but two lovebird jodis inside the house. But at the grand finale today everything was forgotten as the ex-contestants of this season of Bigg Boss came together to dance on stage to add to the excitement. While Armaan Kohli looked comical as he tried but failed to match steps with host Salman Khan on a bhangra number, everyone's favorite contestant Elli Avram looked a perfect match with Salman as the duo danced on his song Mashallah, mashallah! Almost everyone grooved with Salman Khan including Kamya Punjabi and Pratyusha Bannerjee who danced with him on the Fevicol se number. The ever entertaining VJ Andy who is forever in a funky element gave a colorful solo performance on the song Besharam while Salman bought the house down with his dance act Hud Hud Dabang from his own movie. All the four finalists - Ajaz Khan, Gauhar Khan, Sangram Singh and Tanisha Mukherjee got a nice, royal treatment from Bigg Boss on the second last day of the show which was yesterday. They had professionals to give them beauty treatment and fashion designers who came with outfits which will make them look perfect at the grand finale! Sangram was the first to come out followed by Ajaz leaving Tanisha and Gauhar to fight it out as runners up. Ajaz however had bad news waiting for him after his arrival outside the Bigg Boss house and no one from his family or friends but the police were there waiting to question him against an alleged derogatory remark he had made on the show about a political leader. While Payal Rohatgi came to support Sangram and looked visually upset, mommies of Tanisha & Gauhar - actress Tanuja & Razia Khan respectively were there to support their darling daughters. Gauhar's sister Nigaar Khan too was present and she and her mom also were heard saying that they themselves too had voted for Gauhar. And the results were there for all to see. Even as both the finalists - Tanisha & Gauhar in their designer gowns stood to Salman's each side with maximum votes in her kitty, Gauhar was declared the winner. True to her style, Gauhar looked as if she was about to faint by the time her name was announced as the winner but she regained her composure as she clutched hard on to the trophy! She even shared the trophy on stage for a second with Tanisha as they lifted it together for the cameras and the very next moment all the ex-contestants came on stage to wish her. While Kushal was the first to wish Gauhar, we saw Armaan going towards Tanisha who has been his favorite on the show! The countdown to the Bigg Boss 7 grand finale has started, and the evicted contestants have rehearsed hard and given some vibrant performances. The show's host Salman Khan, who celebrates his birthday a day before the finale, joined in as well. Pratyusha Banerjee and Kamya Punjabi danced to the beats of Dabangg 2's Fevicol Se, with Salman. Please click Next to see more pictures from the grand finale. Elli Avram, one of the most likable contestants in Bigg Boss, danced to classics like Yeh Mera Deewanapan Hai and Hawa Hawai. Elli, who made her acting debut in the film Mickey Virus, had said during her eviction that she had wanted to stay longer in the Bigg Boss house. 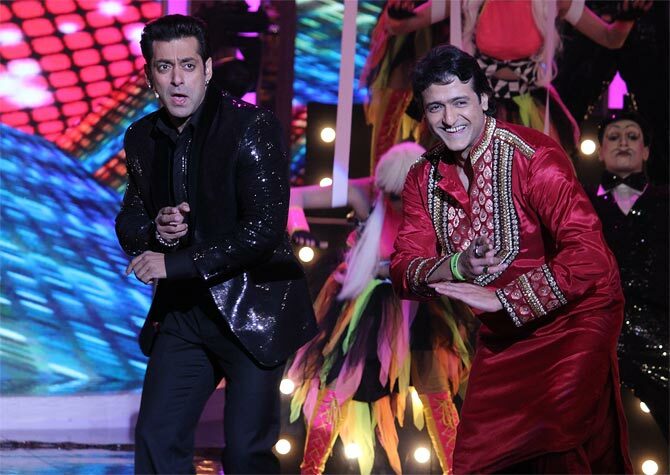 Armaan Kohli seemed to be in a good mood, as he danced with Salman on Bodyguard's Desi Beat. Armaan saw himself in a lot of controversy during his stay in Bigg Boss, and even had to make a trip to the police station when Sofia Hayat accused him of hitting her with a mop. Sofia, incidentally, claims that she will not attend the grand finale. There are four contestants left in the house -- Gauahar, Tanisha, Sangram and Ajaz. Watch the grand finale of Bigg Boss 7 on December 28 on Colors channel. Bigg Boss 7. 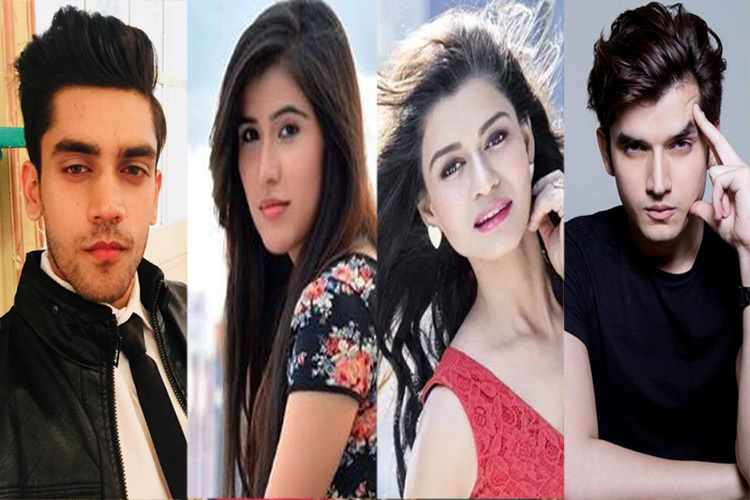 And as time inches towards the grand finale of small screens’ most controversial show Bigg Boss, speculations have already started on who will be declared the winner of season 7. Gauahar Khan, Tanishaa Mukherjee, Ajaz Khan and Sangram Singh is the four lucky top contestants to reach the finale after VJ Andy‘s shocking eviction recently. Each one of them is now excited and is prepping up for the finale, Yesterdays show showed these four contestants their journey so far and also the way their team of professional stylists was helping them to deck up for the occasion. After all surviving is Bigg Boss house is no small feat… So we thought of taking you down the memory lane to the first day of the season… the premiere post. We wrote a few words about each contestant to introduce them to you all, now when you know them well… Let’s see how correct or incorrect the first impression was. Kajol’s Fans knows her as her Sister, Ajay Devgan’s fans knows her as his Sister in Law, Rani Mukherji’s fans knows her as her Cousin… What does her fans (the amount she has) knows her as…Well maybe that’s why she is here in the house to get known!!! So!!! Will she succeed or who knows what after all this is Bigg Boss’s House. Oh la la!!!! Well there is no end to them… with she caught kissing or making out on the show… or Kushal and her fight… or people objectifying her letting Armaan objectify her… or her turning from a Great captain and fair player to a bias friend/ entourage… Or an apparent allegation of Salman favoring her due to her connection… or that Ajay and Kajol are putting up pressure over the Channel and show to get her out. His struggle story had bought him the ticket to heaven… ohk, earlier Rajat and now Sangram in heaven… I am wondering the Kitchen King or Queen is having trouble coming their way. He is a struggler all right, but the struggle to accept a mistake that he has done is not in build in him…. strong from the body, but not that strong from the head. He has been susceptible to what others say, easily gets confused and would think over and over for the smallest of things. But one thing is for sure… The patience this guy has is worth worshipping plus if you did not learn the art and benefits of Yoga from this dude, then you have definitely missed a grand chance. His Coughs or throat clearing whenever a question is thrown his way or while speaking in any negotiating situations has been the talk of the town; the lamest of people have guessed his thinking/ lying pattern… even Rajat Sharma quoted it. Sangram you might need to re work on your Poker face. Well that was her bargain chip… Quitting the house for Kushal and then to return to be proved as one person who don’t care for results but stand for the truth. But dear, the audience knew the 50 Lakh contract term of bigg boss house if you quite voluntarily. She had to answer every question of everybody even when what the other said was far away from being a question at all. Standing up is correct dear, but adding heels to add height will not always be advisable. But the controversies were not just for war… they are for love as well, will Kushal and Gauhar’s supposed dating status stay as strong as it was inside or was all this just a part and parcel of the game. Only time will tell. As much as a person can make… from being the aggressive guy to the third wheel of a love story, he has tried to play every possible role in the house. But has his tac- tics given him a good chance with directors for future… Worst come worst we think he can participate and win an Antakshri competition, with amazing marks. Yup!!! we might have not realized it… but a lot have had happened in the span of these 100 days and to prove that the grand finale of controversial reality is going to be huge with host Salman Khan shaking a leg with the contestants on stage. Well we know it has been a ritual from long…. So what is so different, well does Salman Khan dances with Elli… who fixated him with her beauty and innocence in every season finale. No!!!! so in addition to know who has won the show, we have a lot to look forward to tonight. 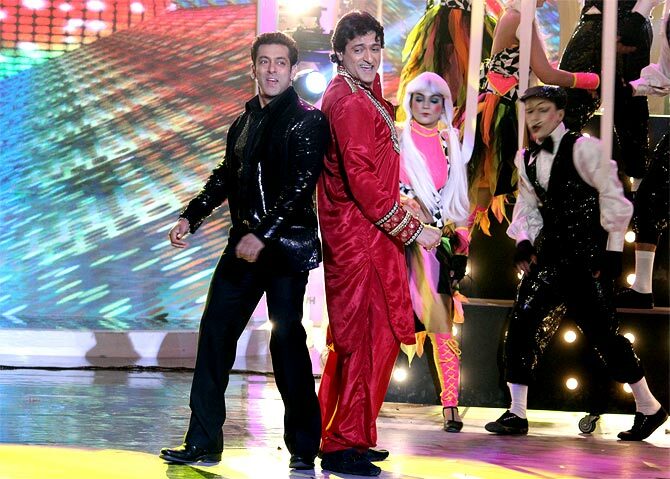 Salman Khan will also shake a leg with Armaan Kohli on his popular number ‘Desi Beat‘ from ‘Bodyguard‘. Besties Pratyusha Banerjee and Kamya Punjabi will also be seen dancing with Salman on item number ‘Fevicol Se‘. Other housemates including finalists Ajaz, Sangram, Gauahar and Tanisha will also be putting up performing acts for the grand affair. Tanishaa-Armaan and Gauhar-Kushal will put up a romantic act, while Ajaz, Sangram and Andy will present an act won the lines of a comedy. Well!!!! So are you guys super excited or not… well we have heard a gossip around the town, it might be wrong but I don’t want to miss a chance saying I told you so… here it goes, Gauhar Khan is the winner of Bigg Boss 7. Tanisha-Armaan, Gauhar-Kushal to groove together at Grand Finale of Bigg Boss 7! The judgement day is arrived. After 103 episodes of long journey, TV’s most controversial show Bigg Boss is inches closer to finale and fans, viewers have been eagerly waiting to see as who among the four-Gauhar Khan, Tanisha Mukherji, Sangram Singh and Ajaz Khan, will be the winner of season 7. Apart from this what making the fans excited are the performances which will be done by the actors and contestants on the final episode. Interestingly, this time the grand finale of the show will be a gala affair with some breath-taking performances. Bigg Boss housemates including all the finalists will also be performing for the finale. For the first time, the finalist of the show will perform with the eliminated contestants of the show. Tanisha will be seen shaking her leg with Armaan Kohli and Gauhar with Kushal Tandon. Both the couple will present a romantic act while Ajaz, Sangram and Andy will present a funny act. Apart from these, Salman will perform with Elli Avram. Pratyusha Banerjee and Kamya Punjabi will also share the stage with Salman after giving their individual acts. Excited to watch these splendid dance performances? Do watch the extravagant night starting from 8pm on Colors. Elli Avram to perform with Salman Khan at the grand finale of Bigg Boss 7! Ex-contestant of Bigg Boss 7, Elli Avram will shake a leg with Salman Khan on the grand finale episode. If believe sources Salman asked his favorite contestant Elli to perform on Katrina Kaif's famous track Masha Allah at the grand Finale. Salman wants Ell to share the stage with him. It is learnt that the actor has personally picked the track from his super hit film Ek Tha Tiger. An insider said, “Salman feels Elli has all the qualities to match Katrina's footsteps. She is also resemblances the diva.” Those who have followed the show must have seen Salman often referred to her as “Paanch saal pehle ki Katrina Kaif.” Even Elli, who speaks in broken Hindi, managed to grasp songs like Tere bina jiya jaaye na and Hum dil de chuke sanam on the show. She was also seen dedicating the songs to Salman, whom she often referred to as Salmanji or Salman jaan. It is reported that Elli, who made her Bollywood debut with Mickey Virus, has already started rehearsing for the act. Salman is likely to shoot this performance on his birthday. Well, it is not the first time that Salman and Elli will be seen dancing together. The two jived on Sathiya ye tune kya kiya after Elli's eviction from the show November 23. Apart from Elli and Salman, Armaan Kohli, Pratyusha Banerjee, and Kamya PunjabiKushal Tandon among more will also perform on the finale night.